Ole Gunnar Solskjaer is astute enough to realise that memories do not win matches. It is fair to assume, then, that Clive Tyldesley's most famous commentary will not be getting an airing on the Manchester United team bus to the Nou Camp tomorrow night. Turning round a one-goal deficit against Barcelona tomorrow would arguably be a bigger achievement, given that United are not as strong a force now as they were then. Solskjaer's task is to work out how to do it and, rather than reach into the distant past, he will call on more recent examples of remarkable European comebacks to inspire his players. After all, it is only six weeks since United travelled to Paris St Germain in the last 16, trailing 2-0 from the first leg and with no-one outside Old Trafford giving them a chance. They came through. Even in the late autumn, as Jose Mourinho grumbled and harrumphed his way towards the sack, his team scored twice in the final five minutes to beat Juventus in Turin. So, Solskjaer reasons, he will not need to mention 1999 at all. "No I won't, because that was against Bayern Munich," he said. "It was a final, it was different. "We will use the PSG match, we will use the Juventus away win. We have beaten some good teams away from home this season and played against some great players." A dose of reality is required at this point. United have lost four of their past six matches in all competitions, and failed to register a shot on target in last Wednesday's first leg against Barcelona, who secured a straightforward 1-0 victory without having to be at their best. In addition, they will be facing a refreshed Barca forward line - Lionel Messi, who was rested, and Luis Suarez, through suspension, sat out Saturday's 0-0 draw at Huesca, La Liga's bottom club. United are not playing well at the moment. 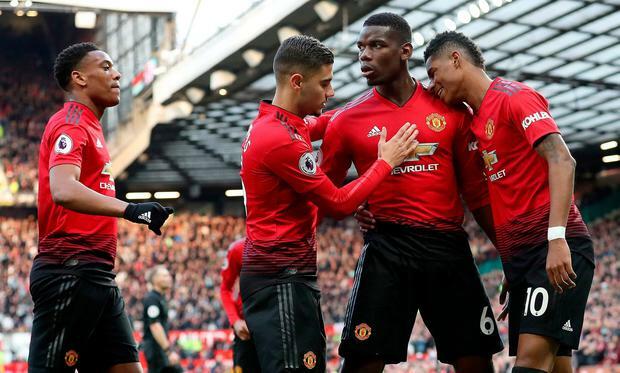 Since their victory at Parc des Princes, their only two wins have come despite under-par performances; they were unimpressive in defeating Watford late last month and very fortunate to beat West Ham on Saturday. It was a strange game, played in a muted atmosphere that suggested even the fans were saving themselves for Barcelona. Solskjaer left Marcus Rashford, Victor Lindelof and Scott McTominay out of his starting line-up with the Nou Camp trip in mind, and watched the team he picked put in a disjointed performance. Too many promising build-ups were squandered by a poor final ball, too many players were off key. United pulled through thanks to Paul Pogba and David de Gea. The France midfielder, likely to be a Real Madrid target for the foreseeable future, ended an eight-match goal drought by converting two penalties, either side of a Felipe Anderson equaliser for West Ham. De Gea, whose poor throw-out had contributed to Anderson's goal, redeemed himself with the score at 1-1 by saving brilliantly from a header by substitute Michail Antonio, who had hit the crossbar moments earlier. This was one of Pogba's better days, following a two-month run of form best described as inconsistent. He is the sort of personality who ought to thrive on the Nou Camp stage. Solskjaer will hope, too, that the pace of Rashford, effective on Saturday after coming on as a substitute, and Anthony Martial will cause Barcelona more problems than it did for West Ham at Old Trafford. Nemanja Matic will travel with the squad, having overcome the illness that kept him out of the first leg, but Ander Herrera remains absent with a thigh injury. "Yeah, you look at the quality of those players and that gives us a threat," Solskjaer said. "We carry a goal threat. "But of course, what we did against PSG must give everyone a huge confidence boost, because that experience was probably the best those players have had for many years. "They are probably dreaming about another one of those at the Nou Camp." (© Daily Telegraph, London).